Founded in 1862, the Union Pacific Railroad originally carried passengers and freight until 1971 when it became a freight-only carrier operating 8,600 locomotives over 32,000 route-miles in 23 states west of Chicago and New Orleans. No other railroad in this country has retained its historical equipment and honored its history like Union Pacific. The preservation of its fleet speaks to the high value Union Pacific places on its heritage and its role in America’s history. 2019 marks the 150th anniversary of the completion of the first transcontinental railroad (May 10, 1869-May 10, 2019) and noted author John Kelly felt this was the perfect time to look back at some of the most important milestones and defining moments in the long UP history. The author has culled through a huge archive of material to concentrate on six decades that showcase the many important roles UP played in the building of America. Helping bring life to the story is an array of photos with extended captions as well as vintage Union Pacific timetables, travel brochures, dining car menus, postcards, tickets, maps and advertising. "Building the First Transcontinental Railroad" chronicles one of the greatest epics in American history. "All Aboard for Yellowstone" showcases Union Pacific’s Grand Circle Tours with trains to Zion, Bryce Canyon and Yellowstone National Park during the lively 1920s. "Tomorrow’s Train Today" highlights Union Pacific’s M-10000 and “City” streamliners to Portland, Los Angeles, San Francisco and Denver in the 1930s. "The Strategic Middle Route" salutes American soldiers during World War II and the legendary North Platte Canteen in the 1940s. "Along the Union Pacific" tracks "City" Streamliners and Domeliners during the 1950s and 1960s, and the end of Union Pacific passenger service in 1971. 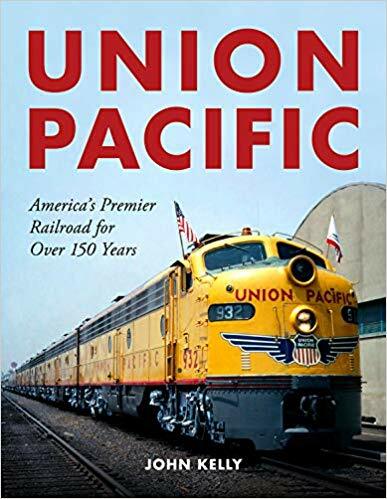 The final chapter features notable photos of Union Pacific steam, diesel, and gas turbine-electric locomotives, plus a full-color image of Union Pacific’s Heritage locomotive fleet.